The KitchenAid 12-inch Convection Countertop oven offers a spacious capacity which easily accommodates up to two 12-inch pizzas. And to help you prepare for any meal or party, it can fit a 4-lb chicken, four chicken breasts, a variety of bread for toasting, and much more. 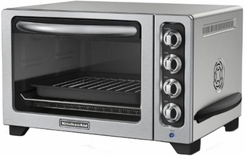 In addition you will have full-Size Oven Performance on Your Countertop with a Consistent, even heating up to 450°F with Broil and Convection Bake functions. With convection, you’ll enjoy evenly baked cookies and faster cooking times. A 60-minute timer allows you to bake or broil foods that require longer cooking times. You can also use the Warm function to reheat a full plate of leftovers.